Most of us would rather spend a week in the Department of Motor Vehicles before intentionally breaking the law. Unfortunately, as in all of life, the above rule is subject to many grey areas, areas that, without some forethought and a healthy dose of common sense, can spell legal trouble for Joe or Jane Photographer. So there are some caveats to consider before planning your next public photo venture. Also remember, there’s a big difference between taking a photo and how a photo is utilized, especially in regards to its commercial use. The issue of copyright is vast and ever-changing but that’s another story for another day. This list will focus on keeping you out of hot water during the photo op. Be it amateur or professional photography, photojournalism or just plain photo-opportunism, the old catch-all rule of “reasonable expectation of privacy” is being strained to its limits. Digital photography, the Internet, and most of all, the fact that an estimated 87% of the population does not leave the house these days without a camera (phone), ensures that everyone is a potential media maven. Though they are bound by the same rules as professionals; I would guess, of that 87%— 86.9% are ignorant of privacy laws and have little interest in learning about them. So this commentary is aimed at you, the serious and semi-serious devotee who works at and respects the art and craft of photography. “Reasonable expectation of privacy” often comes down to context. Using a seemingly innocuous photo of a person (especially if they are well known) to illustrate a controversial article or story, is playing with legal fire. On the other hand, elected officials and well known public figures give up certain rights to privacy when they make the decision to enter the public arena (this is where the “clear as mud” part comes in). Again the “clear as mud” part takes effect when the term “highly offensive to a reasonable person” rears its ugly head. A “reasonable person” is often described in legal terms as a “person in society who exercises average care, skill, and judgment in conduct and who serves as a comparative standard for determining liability”. This is very likely to get you a civil suit or a punch in the nose, and in this litigious age, the punch in the nose might be the lesser of two evils. A) Activity taking place in restricted area(s) of the park. B) Using any sets, props, crew, actors, etc., that are not part of the natural surroundings or facilities. C) Administrative expenses that park officials may incur to monitor and coordinate activity. These examples may sound extreme for the average photographer who just wants to get off the beaten path and snap a few stills, but if they apply to you, skirting the bounds of any one of these points is likely to attract unwanted attention from park officials. If, however, you are a commercial or pro photographer and plan to stay on the beaten path, the same park rules that apply to the average visitor will generally apply to you. In the end, rules and regulations can vary from state to state and are often selectively enforced, so always check with The Local Powers That Be. If you want to argue citizen’s rights with a two hundred and seventy-five pound MP (military policeman), go right ahead, but as anyone who’s spent time in a military brig will tell you, it’s a guaranteed no-win proposition. And besides, US Code, Sec. “Photographing and sketching defense installations” sez so. Yes, kids are adorable and they make great photo subjects, but no matter how benign ones intent, following them around a public street or park like a deranged paparazzi will quickly attract the wrong kind of attention. Even if they may not know them, the average passerby is generally protective enough of small children to get on their cell phone and alert the police. Again, even with the most innocent of intentions, a photographer can find themselves in real trouble over seemingly nothing. Children are entitled to a reasonable expectation of privacy in public; the same rights as everyone else. There’s not much they can do discourage the random nut job with a camera— and they don’t have the punching ability of Sean Penn. So, to avoid jail, keep a healthy distance from the little ones, or at least clear it with their parents before snapping away. Okay, that headline may sound a little hyperbolic, but this has become an ongoing issue with the advent and proliferation of digital photography amongst the general populace. To be clear, any US citizen has the legal right to photograph an officer of the law while he or she is in the act of doing their job in a public place. Assuming that you are photographing from a reasonably safe distance from the action, you should be on fairly solid legal ground. Problems can arise however, when said law officer perceives said photographer to be an “obstruction of justice”. This is where it can get a little tricky. Apparently, “obstruction of justice” can be a subjective term amongst the law enforcement community and may be defined as anything from physically intervening between officer and his subject, to standing fifty feet away on an adjacent street corner picking ones nose. Ultimately, it is up to a judge to decide, but in the heat of the moment, It’s pretty much up to the officer to determine what is or what is not “obstruction of justice”. So be careful, arguing with a policeman rarely ends well for anyone and will usually guarantee you an overnight stay in the Flat Iron Inn. Once again, let common sense prevail. Take a deep breadth, explain your case if you must, but in calm even tone with a minimum of hand gestures and body language. And above all, never touch a police officer in any way. The law is heavily weighted in their favor to help them do a very difficult and dangerous job. 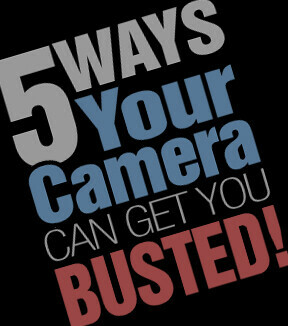 If your camera, film or memory card is confiscated; let it play out in court. Nothing is guaranteed, but never try to bargain with an officer during a heated scenario like this. This article does not constitute legal advice and is not meant to be taken as such. It does, however, encourage Common Sense. Local statutes may differ from state to state, county to county, etc.. It is always a good idea to check with the local authorities if you are in doubt about anything, different places may have restrictions that are unique to them.